Appearance: Dark brown, frothy head, minimal retention, nice spotted lacing. Nose: Carmel, chocolate, vanilla, fig, crispy fresh herb. Taste: Vanilla and malty smoothness up front. Carbonation comes in after and brings in carmel, coffee, toffee, and fig. Notes: This beer gets better as it warms up. A nice and approachable example of a chocolate porter. A dark brown porter with ruby highlights at the edges. The most incredible lacing shines down the glass. Leaves the glass sticky and messy. Looks rich and decadent. Roasted malts on the nose. Smells like a roasty and robust porter, though I don't get much chocolate aroma. There's certainly more chocolate in the flavor and it's actually really nice. Balanced, sweet, bitter, roasted malts, chocolate--very good. A tasty yet unaromatic porter. This beer has a decidedly nice chocolate character. I enjoyed it a lot and it made for a wonderful dessert. On tap at Hangar 24 in Redlands, CA. Pours a slightly murky dark brown with a tan head that fades to a wispy film on top of the beer. Random streaks of lace form on the glass on the drink down. Smell is of dark roasted malt, cocoa, and some coffee. Taste is of dark roasted malt, cocoa, vanilla, and slight coffee flavors. There is a nice mild roasty bitterness with each sip. This beer has a crisp carbonation level with a bubbly mouthfeel. Overall, this is a good porter with some nice aromas and flavors. this beer is REALLY solid and enjoyable, this is currently way underrated. the pour is ok, it does not look as rich as it drinks. the aroma is fine - warm brown bread and candy sweetness. the drink is excellent. deep rich malt flavor, with a hint of chocolate astringency that balances any cloying sweetness from the malts. it is really rich and drinkable and the alcohol is well hidden. this is a delectable Imperial Porter that drinks very smooth. would definitely buy again. PLEASANTLY SURPRISED. A: poured a dark brown in color with brown highlights when held up to the light and had a thin head leaving a little lacing sticking to the glass. S: lots of nuttines upfront on the nose alongside caramel, brown sugar, chocolate, mild dark fruits, and some booze pop out as well. T: the nuttiness flavor also dominated the taste with mild chocolate notes but had brown sugar, caramel, dark fruit accents and a touch of underlying grains. M: the brew was medium in body with a moderate amount of carbonation which had a sweet, chocolatey, mild dark fruity, and creamy finish. D: reall good beer that was like my dessert beer to cap off my session at 38 degrees; drank good. Good retention, collar of white bread. Lacing missing, opaque, mohogany body. Light carb. Chocolate malt is the predominant nose. Simple. Some pork character, a bitterness of the chocolate malt, cocoa nibs missing but possibly bitter from it. Solid body, good amount of carb. Sticky flavors. Cocoa nibs? Vanilla bean? Ya right. A: Pours a deep brown color with a 1/2 finger tan head that recedes down to a thin, foamy cap. S: Nice cocoa nib/coffee aroma with some chocolate milkshake and roasted malt aroma as well. T: Definitely a good amount of chocolate here along with some roasted malt and a bit of a dry bittersweet chocolate and coffee finish. Some faint roasted malt on the finish as well. Pretty tasty. 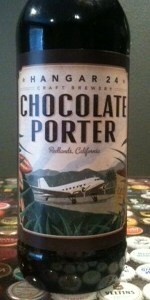 Hangar 24 2010 Chocolate Porter. Served on nitro into a half pint glass at Hangar 24. Reviewed from notes taken in late 2012. A: Pours a lovely bubble show lasting about 20 seconds. Head is one finger of beautiful beige cream, fantastic thickness, and fantastic retention. Body colour is a vibrant understated auburn. Sm: Cream, mocha, amber malts, hints of chocolate. An average strength aroma. T: Creamy chocolate, mocha, amber and dark malts, and an artificial cream finish. Simple but pleasant and enjoyable. The chocolate is restrained. Well balanced. The nitro doesn't mute the flavours. Mf: Smooth, creamy, and wet. Suits the flavours quite well. Good carbonation and thickness. Dr: Very drinkable and enjoyable. I quite like it. Hides its ABV well. I wouldn't get it again, though. One of the better offerings I've had from this brewery. Nitro was a good choice. A: Dark brown on the pour verging on a black body in the glass, but it never appears so. Foamy, rocky and bubbly medium toasted brown head. Minor lacing, small retention ring lining the edges. S: Dusty cocoa powder, roasted chocolate malts, semi-sweet bakers chocolate and even some faint ground up coffee. A bit of lactose towards the back of the aroma. T: Plenty of cocoa beans and milk chocolate without ever getting cloyingly sweet. Roasted malts help balance without being detracting. Simply put, a nice chocolatey porter that never really ventures into the realm of being over-the-top. M: Creamy, medium-bodied although perhaps a touch on the thinner side. Nice coating on the palate, roasted malts give a dry finish. This was quite good; there was enough here to assure you it's a chocolate porter, but it never takes it to say, a Southern Tier level. Depending upon what you're looking for, that may be a good or bad thing. Personally, I thought that made it well balanced and highly drinkable.